The single most important determinant of prices of iron ore will continue to be China, which alone is responsible for two-thirds of the 1.2bn tonnes of seaborne trade in the commodity, writes Kunal Bose. It is not that the world’s second largest economy does not have significant iron ore resources. But much of its ore has iron (Fe) content of 25% or less. The poor ore quality not only makes extraction expensive but to make the mineral useable in blast furnaces it requires thorough washing to remove gangue, which further adds to the cost. Much of Chinese iron ore production of 1.5bn tonnes in 2013, which on import equivalent basis became 340mt (million tonnes), did not find justification on commercial grounds. According to Chinese National Development and Reform Commission, production costs of iron ore in China ranges from $75 to $145 a tonne. This compares very poorly with the break-even price of $44 a tonne for Rio Tinto, $53 a tonne for BHP Billiton, $68 a tonne for Vale and $77 a tonne for Fortescue. Now that the benchmark price of ore with Fe content of 62% fell below $90 a tonne for the first time since 2012, the more high-cost Chinese mines in coastal provinces which were starved of investment in mechanization and new equipment have started closing down. Goldman Sachs is expecting Chinese ore production to fall 10% over two years to 2015. But for the market to be balanced, JP Morgan Chase says China will need to trim production by 64mt in 2014 and a further 85mt by 2017. Making predictions about China is always a risky business. In this instance, however, China Metallurgical Mining Enterprise said in a 30 June statement that many domestic iron ore mines had already been idled. More marginal high-cost mines are on the line. China watchers point out that mine capacity shedding would have been “decisive and faster” but for the fact that considerable volume of ore production is either state-controlled or vertically integrated with major steel mills, many of which again are again state enterprises. The hope lies in President Xi Jinping’s drive to shut uneconomic enterprises across the board to cut losses and protect the environment. Bad mining practices causing environment degradation are widespread in China. JP Morgan Chase considers Chinese iron ore capacity of up to 200mt sticky. Some agencies put sticky mining assets in China at a much higher level. Whatever the figure, China will have to do a comprehensive house cleaning and that too fast to achieve break-even in iron ore mining. The volume of Chinese ore buying in the world market — nearly 820mt of iron ore of foreign origin actually arrived at different ports of the country in 2013 — and port inventories of ore at a given point continue to have a decisive influence on world prices of the steel making raw material. Explaining the reason as to why iron ore is trading at disturbingly low rates for the miners, especially the ones with high operational costs, trade officials say the answer is in the record stockpiles of over 113mt at Chinese ports. Chinese trading houses and steelmakers came into the market with gusto when prices were low to build what is seen as ‘strategic reserve.’ Inventories at ports and with steel mills can take care of China’s steel production for up to 30 days. The mills are, therefore, under no compulsion to buy at this point which alone can prop up prices. The Commonwealth Bank of Australia makes the pertinent observation that “ongoing increase in port stocks suggests to us that mills don’t need to buy immediately and that the supply impulse coming through at the moment continues to outweigh any restocking-led lift in demand.” The prevailing situation warrants that ore prices will struggle for a breakthrough which, however, can happen with a “turnaround in the levels of Chinese iron ore port stocks.” A look back in the history of no love lost relationship between the world’s leading ore producers and Chinese steel industry will give an idea as to why the two will remain engaged in a battle of wits in the marketplace now and also in future. Beijing still nurses grievances that during the regime of annual long-term ore price negotiations the likes of BHP would engage in discussion with steelmakers in Japan instead of members of China Iron & Steel Association. China was also against doing away with annual price contracts. But the miners then in driver’s seat muscled their way through to introduce contracts linked to the spot market. China may still be bearing some grudges against the triumvirate of global miners but the fact remains major commodities like crude oil in the late 1970s, aluminium in early 1980s and thermal coal in early 200s went through similar changes in their pricing system. Henry delivers a clear message — from here ore prices will fall further. From prospecting for deposits to mine opening is a time-consuming process. It becomes more so if infrastructure like road, rail and port is to be created for ore evacuation from mines. Ahead of the 2008-09 world recession, all the big miners put their bet on iron ore. Heavy investments in new mines development made then are now bringing in new ore in the market, tipping seaborne ore market into surplus this year. The big four — Rio, BHP,Vale and Foretescue — will be adding over 100mt of ore to seaborne supply in 2014. A survey estimates extra ore supply of 142mt from Australia, 82mt from Brazil and 61mt from other sources, including African nations by 2016. Interestingly while trade officials are in a consensus that for the market to find balance and prices to get a floor high cost domestic production in China must be phased out, they are aware that Beijing will remain in pursuit of acquiring iron ore assets in several destinations. This China will be doing for its long-term raw materials security. Rising global surplus is not to distract the country from the goal of meeting half its growing ore requirements from domestic mines and owned offshore sources at some point. We all accept that prevailing ore prices have rendered many Chinese mines uncompetitive. But data to support the extent uneconomic mines there remain fairly limited. At the same time, expect the big Chinese mines — having received adequate investments in state-of-the- art underground mining equipment and ore processing plants — to start producing to their capacity. JSW Steel, a leading Indian steel producer, without captive mines will be importing up to 6mt of iron ore this financial year ending March 2015 equalling 20% of its 30mt of annual ore requirements. The company has started receiving shipments of iron ore of foreign origin. Earlier, Tata Steel though having always in the past drawn sufficient quantities of ore from its captive mines to run its 10mt mill at Jamshedpur recently imported 140,000 tonnes of the mineral in two separate shipments. The company says the imports are for “testing purposes.” Who knows, ore imports may become a regular practice for Tata Steel too. With ore stocks on the rise in China — as the economy there slows slightly — it is no surprise that, after peaking at about $150 a tonne in March last year, the price of Brazilian ore fell below $90 a tonne in June this year, writes Patrick Knight. Prices could well fall to about $85 before recovering, suggest analysts. 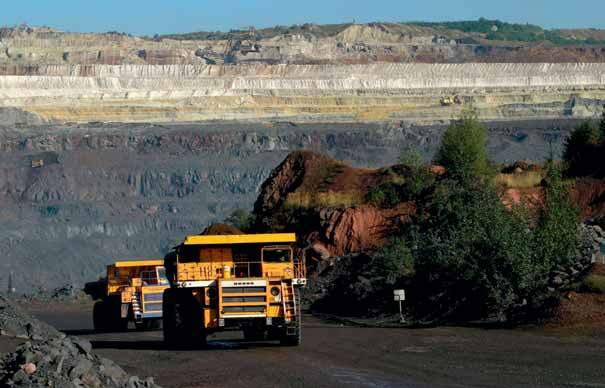 The opening of several large new mines in Australia this year, with more to come next, plus some additional output in Brazil, will add almost 400mt (million tonnes) of ore to world output in the next 18 months. Executives at Vale, which will add about 100mt to output and exports when the large new mine at Carajas starts up in 2018, claim that concern about the slowing of the Chinese economy has been exaggerated. They also note that the impact of discoveries of shale gas in the United States, is encouraging new investments by industry there. Even if the Chinese economy were to grow by only 7.5% a year from now on, say executives, compared with the 10% plus of the past two decades, the country’s economy is now so much larger than before, that an extra 60mt of ore will be needed in China each year until at least 2020. Two-thirds of that will have to be imported. Half of China’s 1.2 billion population already live in cities. But with rules about residence being eased, the proportion in towns will rise to 70–80% of China’s 1.2 billion population in a few years. This has huge implications for extra infrastructure and the steel needed to build it. More than 320mt of ore is now mined in China, and the government is anxious for numerous small mines to merge into six or eight giants. But Vale officials point out that most mines in China are very high cost, while the quality of most ore there is far lower than Brazil’s 62% average. Brazil is now shipping large quantities of lower grade ores to China, at a cost of little more than $70 a tonne. About 15% of the ore China now imports is mined by Vale, and the company hopes to increase that to 20% when its new mine at Carajas opens. No new mines have been opened in Brazil in recent years, with the result that exports have stagnated since 2008. Estimates as to how much it costs to produce in Brazil’s huge mines, whose iron content is amongst the world’s highest, vary from less than $25 per tonne to more than $40. But mines in Brazil, like those in Australia, will be profitable even if the price of ore falls to below $90 a tonne. At this price, up to 50% of the mines in China, as well as most of those in India, would cease to be profitable. Many such mines would close, allowing those in Brazil and Australia to fill the gap. It takes 45 days for ships to travel from Brazil to countries in Asia, which buy 70% of the 300mt of ore shipped from Brazil each year. That produced in Australia can reach there in a third of the time, which explains why Vale is constantly seeking ways to cut the cost of transport. Malaysia, which has storage capacity for 1.5mt and can handle 30mt of ore a year. tonne- capacity ‘Valemax’ ships, designed specially for carrying large quantities of ore to countries in Asia, the destination of 70% of Brazil’s ore, but still unable to access ports in China, will unload their cargo in Malaysia. The ore will be taken to its final destination in smaller vessels. The expansion at Carajas, which will push up Vale’s output in Brazil to 300mt by 2018, will cost about $20 billion. As well as the $3 billion to be spent at the new mine, almost $4 billion will be spent on building a new set of berths, complete with the latest generation of shiploaders, at the port of Itaqui, in Maranhao state. Most of the rest will be spent on duplicating the 800km railway which links the Carajas mine to the port. Thirty trains, each up to 2km long, will soon be using the line each day. In a few years’ time, the port of Itaqui will be able to handle four of the 400,000-tonne-capacity ‘Valemax’ ships simultaneously, with loading speeds 15% faster than is usual now. Under financial pressure,Vale has raised about $5 billion from the sale of numerous assets, including chartering some of its Valemax vessels to a Chinese company. Vale is not the only company mining and exporting ore in Brazil, of course. Following the sharp rise in the price of the commodity, which even now sells for five times what it costs to mine, many other players — including most of Brazil’s leading steel companies, some of which now earn more from exports of ore than those of steel — are expanding their mines. If all goes according to plan, production at Anglo-American’s Minas-Brasil mine will start before the end of this year. About 18 months after ramp-up begins, capacity will have risen to 26mt a year. The ore will travel 525km in a slurry pipeline, the longest in the world, to Anglo’s port at Acu. The mine and port, bought from businessman Eike Batista for US$5 billion in 2005, is now expected to cost almost US$9 billion to complete. The project is four years behind schedule, and will cost three times the original estimate. Anglo is now reported to be looking for a partner to take a share in the Minas-Brasil project. The CSN National Steel company, Brazil’s largest steel producer, expects to produce 37mt of ore at its Casa da Pedra mine in Minas Gerais state this year. of the extra to be exported. CSN is a leading shareholder in the MRS railway network, along whose tracks CSN’s ore, as well as some of the steel it makes, travels to ports each year. CNS also has the contract to build one of the new railways planned to run about 2,000km west from the Atlantic in the north east of the country. But plans to build mines in the north east have been postponed until prospects for ore improve. Samarco, one of the world’s leading producers of pellets, popular with mills making steel by the electric process and which is owned jointly by Vale and BHP-Billiton, has recently started up its fourth pelletization plant adjacent to its port at Uba. Ore from mines in Minas Gerais state, now travels to the port in two slurry pipelines and the new plant takes Samarco’s pellet making capacity at Uba to 30mt. This is only second to the 36mt of pellets Vale can make at its Tubarao terminal in neighbouring Espirito Santo state. The Gerdau steel company, which specializes in long products, is another company which has decided to produce all the ore it needs and to export some as well. Output was raised from 6.5mt, to 11.5mt at Gerdau’s mines late year, and the company plans to raise output to 18mt by 2018. The fate of the part of the massive reserves of ore in Simandou, Guinea which Vale thought it had bought rights to, still remains unclear. Together with an Israeli partner,Vale paid the Guinea government about $500 millions for a 50% share in this mine. But a change of government and accusations of bribery and fraud, resulted in the original contract being rescinded. The new administration in Guinea apparently feels Vale itself did no wrong, however, and has invited the company to bid for a new contract, when this is published. Vale plans to sue its Israeli partner for $1.1 billion, but Vale itself is threatened with an action by Rio Tinto, which has firm rights to 50% of the total reserves at Simandou, but which claims it should control all of the massive reserves. To get the ore to market, a 600km railway will have to be built to a new port, possibly to run through Liberia.